Hello loves! How is everyone's week been so far? I hope you all had a wonderful Valentine's day? I had a lovely Valentine's day though I spent three hours of my evening in a strategic management class. Earlier in the day, I got a surprise delivery from my hubby. I was so shocked when I got a call from him asking me to come outside at work. Initially, I thought he was kidding because he told me earlier that he was at work. When I got outside, he was actually standing there with 2 dozens of pink and red roses. I was blushing like a new bride :) Then my shy self, I had to carry the huge flowers back to my desk and everyone I passed screamed, "awwwww" :) The surprise and flowers definitely made my day--Love you babe! On another note, did you guys watch the Grammys? Any favorite performer? I couldn't get enough of Adele--love her! I also enjoyed Bruno Mars and David Guetta. My least favorite performer was definitely Nicky Minaj. Her whole performance was just weird. Simply spot on!!!! I love your use of color and fantastic shoes! Your husband is so sweet, I'm so glad your Valentines was so wonderful! That is the sweetest Valentines Day story I've heard yet! How awesome! I love all your brights here! You look great in these hot pink pants! wow love all the bright colors! so cute! love this Stella..the bold colours and the print! looking good! 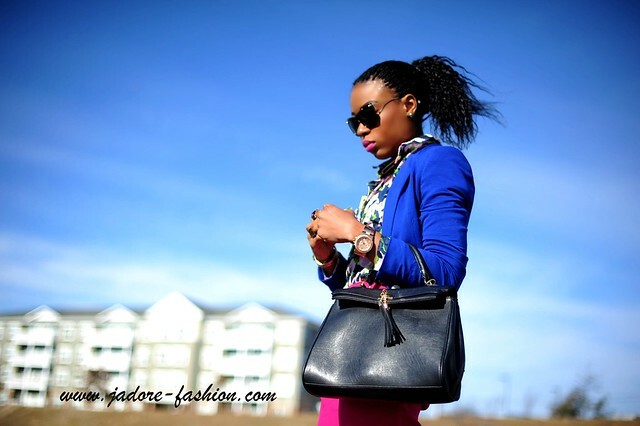 love the colors chic look!!! Beautiful look,hon!Love all these colors! you look stunning! I love your shoes! beautfiul colors, really great outfit! Such a bright outfit, i like it! 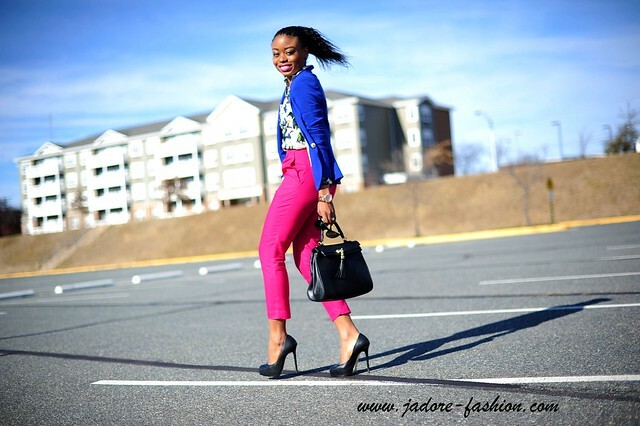 Such a lovely vibrant outfit! I enjoyed the duet that Alicia Keys did! I didn't like the whole Nicki Minaj spectacle either. I thought it was pretty disrespectful. That girl needs prayer. 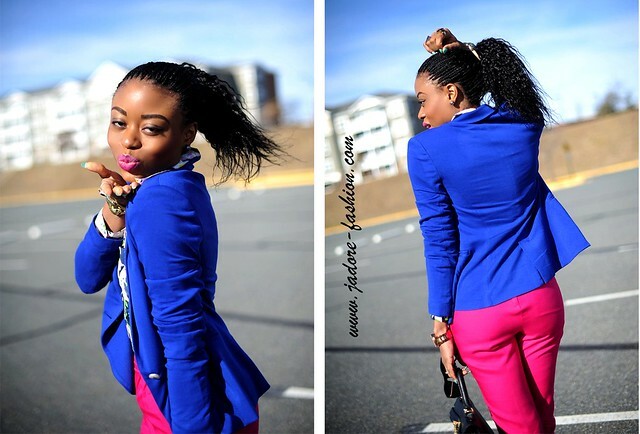 Loving the pink and blue combo and that lipstick is fabulous!!! Just bought a similar shade!! Okay, let me add one more awww...AWWWWW...how sweet - its the small stuff that counts. and I love these 2 colors together so much, that i think I may copy something like this...hmmmmm - I love the floral top as well. aww that's so sweet of him! i was completely bored with the Grammys and although i love nicki minaj to death her performance was disappointing. 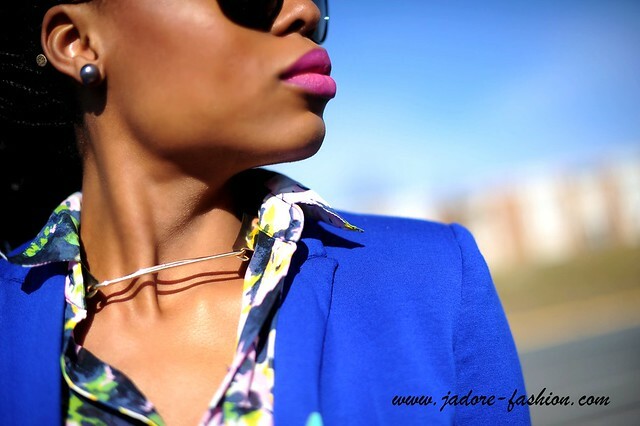 im loving the blouse and the neck piece you have on in this look. those colors are perfect together and wowza at the shoes.....hot! 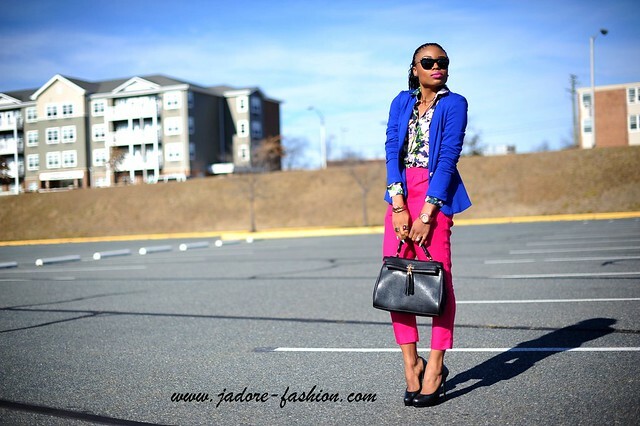 This pink and blue looks great together, working it. Looking fabulous as always, Love the jacket and pants! Aw, your husband is so sweet. Love your pink and blue outfit. You look amazing Stella, love your outfit, blue suits you prefectly! I like our blog and i am now following you, hope to see you soon on my blog! Color blocked perfection. You absolutely nailed the trend but making it your own. Love it! So much color going on...and I'm liking it. Also pretty cool how you turned your necklace around to give something different around your neckline. 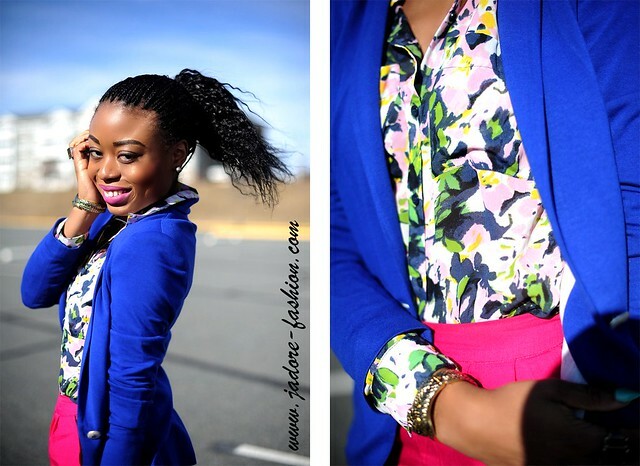 Love the combo of prints and bright colours. then u toned it down with the black purse and shoes. Nice. i just did a blog post and you were part of it. check it out. love u style always. Very Nice photos, love the color combos.